Mozilla last week reported that revenue for 2014 was up 5 per cent, with the bulk of its earnings coming, as always, from the search deals struck for the open-source developer's Firefox browser. The uptick, small though it was, was an improvement over 2013, when Mozilla increased revenue by just half a percentage point. Revenue in 2014 for the Mozilla Foundation was nearly $US330 million, up from $US314 million the year before, according to a financial statement (download PDF) released on November 25. Mozilla Foundation is the non-profit that oversees Mozilla Corp., the commercial arm which develops the Firefox browser and Firefox OS mobile operating system. As has historically been the case, virtually all the foundation's 2014 revenue - $US323 million - came from royalty payments, the bulk of that from search providers, which paid Mozilla to place their engines as the default in Firefox. In 2014, all royalty payments accounted for 98% of the year's income, a slightly-higher portion than in 2013. Search-based revenue was approximately $US291 million, representing 90 per cent of all royalty income and 88% of Mozilla's total revenue. The $US291 million was a 6 per centincrease over 2013. As it has done in the past, Mozilla did not name the largest sources of its income, saying only that, "Mozilla entered into a contract with a search engine provider for royalties which expired in November 2014. In December 2014, Mozilla entered into a contract with another search engine provider for royalties which expires December 2019." The provider whose contract expired last year was Google; Yahoo was the replacement, at least in the U.S. and Canada. A year ago, Mozilla announced it had not renewed the long-standing Google contract, and had signed instead with Yahoo for the North American markets. Additionally, Mozilla inked other deals in Russia and China with Yandex and Baidu, respectively. The bulk of 2014's search revenue, however, continued to come from Google, which paid Mozilla in 11 of the year's 12 months. According to calculations by Computerworld - based on Mozilla's financial statements - Google paid Mozilla more than $800 million in the three years of their last contract. Neither Mozilla or Yahoo has divulged the financial terms of the five-year contract that runs through late 2019. Most of Mozilla's expenses - 67 per cent in 2014, the same percentage as the year before - were spent on software development, which increased from $US197 million in 2013 to $US213 million last year, an 8 per cent increase. Meanwhile, another line item, branding and marketing, declined by 11 per cent, to $US41 million in 2014. Like many multi-national corporations and organizations, Mozilla suffered from currency headwinds as the US dollar grew stronger and other countries' currencies weakened. In 2014, Mozilla took a loss of almost $US6 million from currency exchanges. On the brighter side, contributions to Mozilla in 2014 almost doubled, climbing to $US4.2 million for the year. Overall expenses increased just 8 per cent year-over-year, a far cry from the massive 42 per cent boost in 2013. The difference between that and the 5 per cent increase in revenue, however, meant that Mozilla's "profit" -- it tagged the line as "net cash provided by operating activities" -- fell to $US24 million from $US36 million the year before. But Mozilla Foundation's financials remained solid. Cash, cash equivalents and the organization's investments totaled $US275 million in 2014, up slightly from the year before. With that much in the bank, Mozilla could survive at its 2014 expense pace for slightly more than 10 months if all income dried up. How the persistent decline in Firefox's user share will affect Mozilla's revenue is unknown - the foundation has never disclosed details of its contracts with search providers, nor said whether they were based on query traffic or flat fees - but one hint has been the rise and fall of Yahoo's search share since it signed the Mozilla deal. From the January peak of Yahoo's search traffic in the US - as tracked by comScore - the number of queries to yahoo.com has dipped 7 per cent, while Yahoo's share of all U.S. search slipped half a percentage point, or 4 per cent. While that may not have been entirely due to Firefox's lower share, the results must certainly disappoint Yahoo. Because of Mozilla's financial data release schedule, the true impact of the Yahoo contract won't be evident until next year at this time. 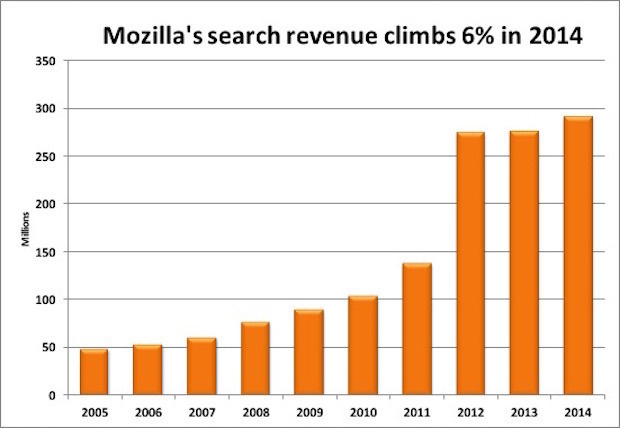 Mozilla's revenue from all its search contracts climbed 6% in 2014, to $291 million.